How Gerry Judah, a London-based artist, came up with the idea of mounting three 911s on top of streamlined steel pillars that extend 24 meters up in the air. We present an extraordinary master of monumental sculpture. Gerry Judah pulls up to the party in a black Cayenne. As the sunset bathes the sky in a lavender hue, calm descends on Porscheplatz in Zuffenhausen. Traffic has all but disappeared on the roundabout encircling the towering new Porsche sculpture, Inspiration 911. Judah will later take his place on a grandstand erected for the official ceremony dedicated to his work of art. 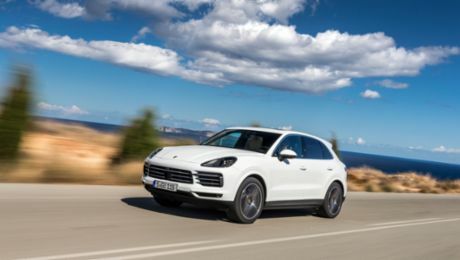 The event will include a tremendous light show and a colorful ballet of classic and contemporary Porsches lapping around the three white pillars, each adorned with a steeply angled white 911 that seems poised to rocket up into the night sky. The 64-year-old Londoner is a striking figure among the guests who have assembled at the Porsche Museum for the ceremony. He has an imposing stature and a full white beard, and is dressed entirely in black. Yet his demeanor is friendly and approachable, and he seems more interested in the creation of art rather than the proximity to power. He greets the workshop employees with enthusiasm. They prepared the three 911s that will now reside atop the pillars for years or even decades, exposed to wind and weather. “You were wonderful,” he says, and the men smile shyly, shaking his hand with pleasure. Judah knows how important a congenial team is for his work. A team that can understand his vision, and was not brought together at the last minute to assemble. 400 meters of molded steel beams into the layered, leaning, and winding 36-meter structure that towered above this year’s Goodwood Festival of Speed. For nearly 20 years now, Judah has been designing and constructing the gigantic main sculpture for the legendary English automotive event hosted by the Earl of March on his estate in West Sussex. Judah was born in Calcutta in 1951, where his grandparents had settled after leaving Baghdad. He spent his childhood in West Bengal until the age of ten, when he and his family moved to London. He left school at age 16 and worked at various jobs: in restaurants, as a porter, and as a draftsman. Later, he studied art at leading colleges in London, opened a studio in the city’s West End, and began creating large-scale sculptures and fabulous three-dimensional paintings. He financed his artwork by working for theaters, opera houses, film makers, and photographers. He has built sets for Ridley Scott, the Royal Shakespeare Company, and performers including The Who, Led Zeppelin, and Michael Jackson. While working on backdrops for photo shoots in the 1980s, Judah met a gifted photographer named Charles Settrington. “My phone rang one day several years later and Lord March was on the line,” Judah recalls. Charles Settrington, who had since received his aristocratic title, asked Judah to build an enormous triumphal arch with a Ferrari hanging from it for the Festival of Speed on his estate. 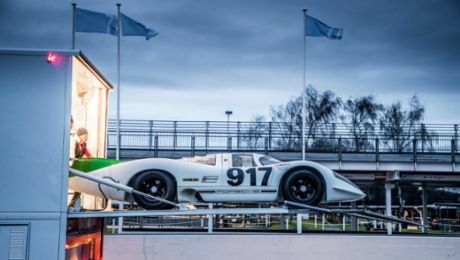 Time was of the essence, so Judah and his team climbed the scaffolding in wind and rain to bolt and paint the first sculpture in what would become a series of legendary large-scale works of automotive art at the annual Goodwood Festival. The Goodwood sculptures—also known as the “central feature” of the festival—stand for just two or three weeks before being dismantled and scrapped. Year by year, they have become larger, more daring, and more sensational. Judah has mounted historic race cars on gigantic loops, and constructed a 28-meter sports car out of tubes that stood straight up on its nose. In 2013, his second contract for Porsche involved a breathtaking structure of three 911s fitted to gigantic, slanted steel prongs that seemed to defy the laws of physics.